From the creators of Michael Myers Versus Jason Voorhees comes a new short horror film, septeMber. The iconic battle between two of horrors heavyweights has had over 100,000 views and is murdering the internet. So its only natural that the creators would want to do do more short films. The new short, septeMber is the first in a series of 7 films that will surely get your blood pumping and your mind racing. If septeMber is any indication of the horrors that await us in this series, then we are all in store for one hell of a ride. 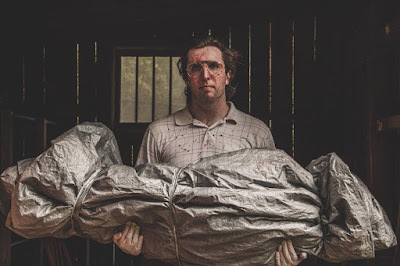 Writer / Director, Mason McDonald crafts a studio quality piece of horror. Jeff Payne portrays a character that is simply chilling to watch and reminds me a bit of Patrick Bateman (Christian Bale) in American Psycho. Tabitha McDonald performs the tasks of Editor / Grip / Effects. Dustin Miller wrote/recorded the song exclusively for septeMber. Mason, Jeff, Tabitha, and Dustin are re-painting the horror landscape and their choice of color is Dark Red. Be sure to check out the links below which include their website, social media links and a link to the short film septeMber.